Is it time to paint that old GTO? Compare all the choices! Thanks to John Hugentober of Lebanon Ohio for loaning me his paint chips! Mayfair Maize code "40" "Y"
Midnight Green code "57" "M"
Palladium Silver code "69" "P"
Cameo White code "50" "C"
Limelight Green code "59" "H"
Carousel Red (Frequent Judge color) is code "72" or "T", NOT code "65" as some incorrect Pontiac literature states. Liberty Blue code "51" "E"
Expresso Brown code "61" "B"
Verdoro Green code "73" "Q"
Matador Red code "52" "R"
Goldenrod Yellow code "76" "W"
Warwick Blue code "53" "D"
Antique Gold code "65" "G"
Windward Blue code "87" "F"
Crystal Turquoise code "55" "K"
Starlight Black code "10" "A"
Sean, Carousel Red ("T" or 72) was available as a "special order" paint color on all 1969 Pontiacs, not just the Judge and some Firebirds. A considerable number of 1969 non-Judge GTOs were painted this color. I have even heard some refer to this as a "Judge Delete" option, but no such "Judge Delete" option ever existed! Today, most folks think that if they find a '69 GTO with a Carousel Red ("T" or 72) trim tag, it has to be a Judge.........NOT so!!! 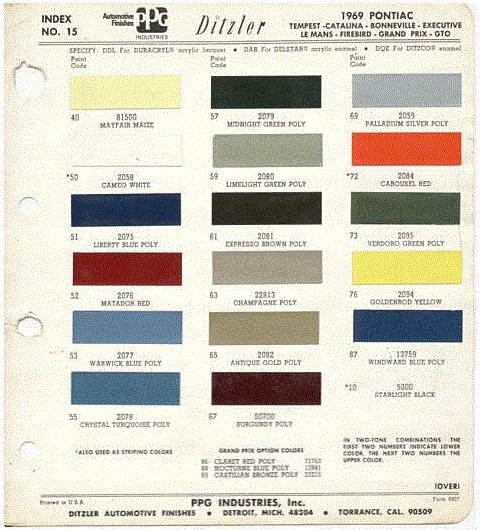 Want to see another version of the 1969 paint colors? Robert Ziwani (Robert.Ziwani@canada.sun.com) sent this whole Ditzler color chip page out of a paint selector book. Major automotive paint stores have these books.